Build on to your Signing Smart Play Classes with our Intermediate level programming. All new signs, activities, and Signing Smart strategies provide another 10-weeks of fun and learning. Emphasis is on extended interactions, pretend play, tools to facilitate spoken language, and extended learning. For instructors looking to expand their Signing Smart Play Classes by offering Intermediate level programming. Includes detailed, step-by-step information for and outlines of 10-weeks' worth of all new programming. Designed for children 12 months (or walking) and older, the activities in the Intermediate Curriculum will engage children and facilitate development. 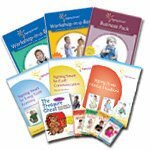 Curriculum incorporates many new and more advanced parent-child activities and songs, new signs, and new developmental information designed to help parents use Signing Smart strategies to facilitate spoken vocabulary development, sentence use, long-term learning, cognitive development, and early literacy. Activities highlight pretend play, symbolic play, concept mapping, and extended interactions. Also includes: CD of supporting documents; DVD Clip Bank of "at home" clips of families using and demonstrating the intermediate-level Signing Smart strategies. DVD contains child versions of many target signs, including children?s early signed sentences, which allows families to better recognize their own child's signs and sign combinations. The clips also allow families to see the ways advancements happen in young children, encouraging parents to recognize their own child's developmental accomplishments. Click here to find out more about the support and resources available for Signing Smart Instructors Please Contact Us for information on becoming a Signing Smart Instructor and to purchase the Intermediate Play Class Curriculum.